I first found out about Knights of the Arcade at Tekko 2015 and have been trying to go ever since. For seriously two years every date they announce has conflicted with something else going on in my life. They’ve usually been the last weekend of each month, but this June it was held on the 16th and lo and behold as the stars aligned and free time reared its ugly head for the first weekend in two years. I finally got to head out to the Arcade Comedy Theater to see Knights of the Arcade, read on to find out how it went. DISCLAIMER: I was provided complimentary tickets to Knights of the Arcade. 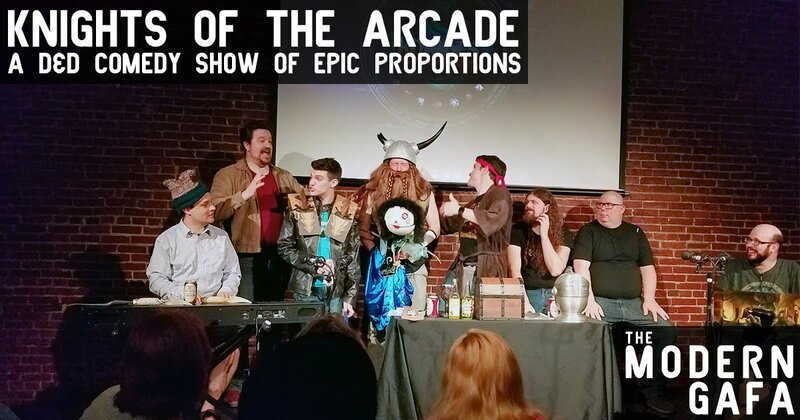 Knights of the Arcade is a live Dungeons & Dragons game played on a stage by comedians, improvisers, and tried-and-true geeks. The Knights embark on a monthly quest built entirely from audience suggestions. With special guests, video-projected dice, and a lively audience cheering along with every Critical Hit, Knights of the Arcade is unlike any show in the Burgh. There are actually three versions of the Knights of the Arcade show. 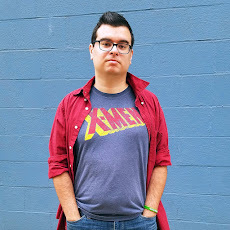 At 8 PM is a more general variety show with sketch comedy, improv, music, and a “mini-quest.” The 10 PM show is the real deal, a full blown 90 minute RPG campaign with dice rolls and battles. Every other month there is a drunker midnight show. All shows are BYOB. When we arrived at the Arcade Comedy Theater, we were given a card to fill out with information about our own roleplaying character; one lucky audience member would get chosen to be the quest giver and actually drive much of the main story. Guess what? At my first ever Knights of the Arcade show the person chosen was none other than my wife Katrina. Her D&D character, Mara Moonshine, sent the Knights on a quest to find her stolen fleet-footed flip flops. Regulars told us afterward that she did great as people usually freeze when they’re called up on stage. The rest of the show was fantastic. 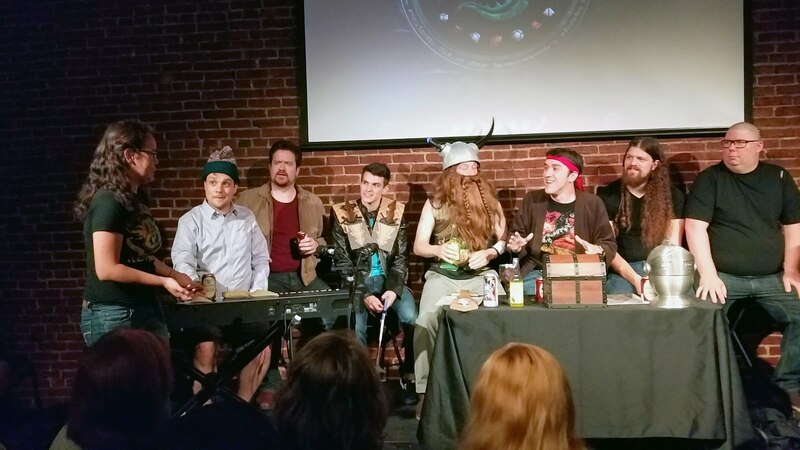 The balance party included a bard who mans a keyboard the entire show, halfling rogue, a dwarf self-described as “Chaotic Stupid,” a monk, a sorceress who apparently always makes jokes no one understands (she was absent when we went and represented by a stick puppet), and a... kangaroo fighter? That must be from an edition I’m not familiar with. The first “act” of the show had the Knights on the last leg of their previous quest, which was suggested by an audience member and involved a town of people made of butter and an ice cream factory. While they’re not playing a “real” game, they’re really playing. The Dungeon Master describes situations and sometimes calls out people’s turns, but sometimes they just shout out what they do and sometimes they do like 3 things in a row. It really doesn’t matter; it’s all just nonsense fun. That’s the whole show: hilariously zany Dungeons & Dragons. The players will say random stuff like “I go down the chimney” or “I use my disguise ability to dress up like an ice cream sandwich.” and what the d20 says goes. And if there’s a perfect 20, the entire (mostly drunk) audience goes wild and cheers along. Knights of the Arcade is a blast! It’s funny, exciting, and even gets kind of emotional. There’s comedy, action (in your head), and even some awesome song numbers. The story continues from month to month with regulars attending every show, but I assure you that no matter when you go it’s going to be the greatest Dungeons & Dragons game you’ve ever witnessed! Get your tickets to Knights of the Arcade here.